People often buy other things when they go into the store to get their prescriptions. Ultimately, it is the pharmacy that provides your savings. So please remember to thank your pharmacy for its participation in the FamilyWize network and for the important and positive difference they are making for you, your family and your community. All funding for the FamilyWize program is provided by part of the dispensing fee that is included in the cost of medicines when a FamilyWize card is used to save you money, and by in-kind donations and reduced costs from the program sponsors. Pharmacies all across the country are taking an active role in helping people get affordable prescription medication! Take the FamilyWize Prescription Discount Card to a participating pharmacy to get discounts of up to 75% on generic and brand name prescription drugs. 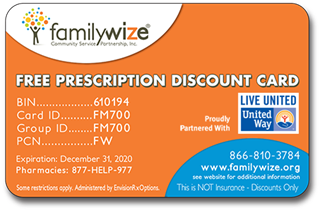 The pharmacies use the FamilyWize discount drug card like a reusable prescription coupon. This Rx discount card lowers the cost of your prescription drug expenses – over and over again. This helps you get the medicine you need, when you need it! Over 60,000 participating pharmacy chains and private pharmacies, such as Walgreens, Rite Aid, CVS, Walmart, Target, Kmart and many more take the prescription card to provide deep discounts on prescription medicines.